I am cold, my kids are cold, tomatoes are cold, even compost pile is getting cold.. in July. I am out wearing a polar fleece today. Summer is absent and Cliff Mass says it’s going to be absent for another couple weeks. There’s persistent cloud cover that won’t budge, light is so dim we have to put indoor light on at 4pm. Only good news is I haven’t watered lawn at all this year, not even single time. Now who wants to trade spots with this part of the country? I don’t think peppers are going to survive this year, CVG doesn’t think either. 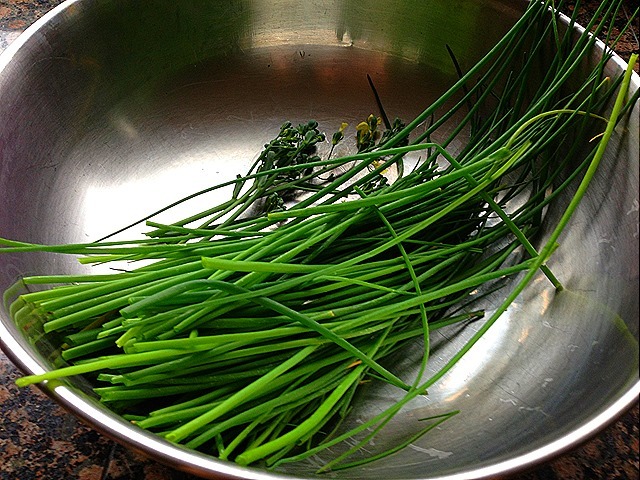 Here’s walkthrough of garden – it’s cold and soggy. 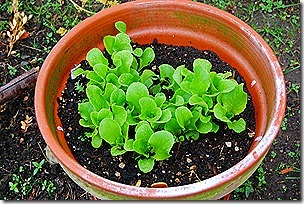 Lettuce: (Black Seeded Simpson) in container. Seeds are from local ACE hardware shop. Sown on 14 June. 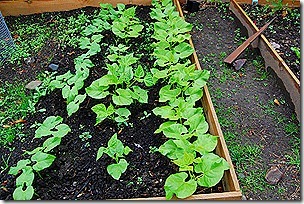 Bush Beans: (contender and blue lake bush). Seeds are from trusted Ed Hume, sown on 12 June and 26 June. Last year’s beans were bountiful, I am growing them on same spot this year. 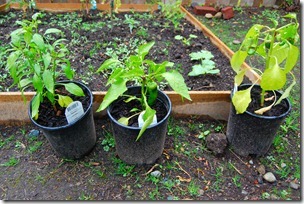 Peppers: (Nu Mex Joe Parker, Italia Sweet and Thai Orange) all of the pepper plants are bought from local Home Depot. Joe parker is getting big, ready to be harvested next week. 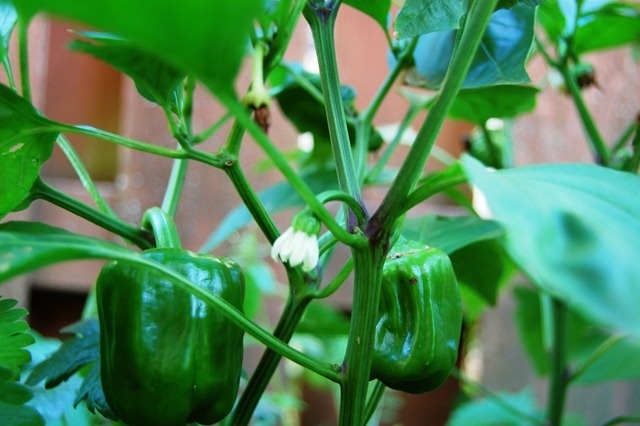 Thai peppers are suffering from cold, yet to flower. Italia variety have 2-3 tiny peppers. Nothing looks promising in this cold. Heat loving plants like pepper and eggplant are definitely not loving this weather. 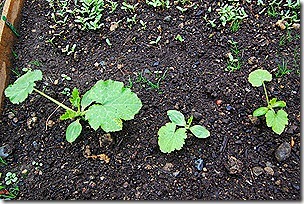 Summer Squash aka Zucchini: (Black and Yellow) I sown 2 types, I don’t know which seedling is which, I lost track of what I sown. I guess I’ll find out in a month. Last year I was looking at zuk blossoms by this time, not sure what’s in store this year. Seeds come from Ferry Morse and Ed Hume. Sown on 13th June. Tomatoes: (Black Plum, Chocolate Cherry, Yellow Pear and Roma). 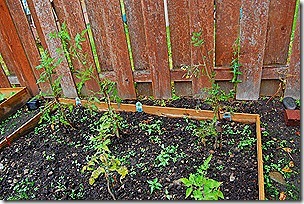 Look at my tomatoes, they look pitiful. Can you even spot 5 tomato plants here? Errr…. tomatoes are hating hating hating this weather, they are hardly growing, blossoms are falling off in cool, not setting any tomatoes. I have least expectations from Black plum but cherry types should set tiny fruits (usually I have seen cherry types setting fruit even in cooler weather. 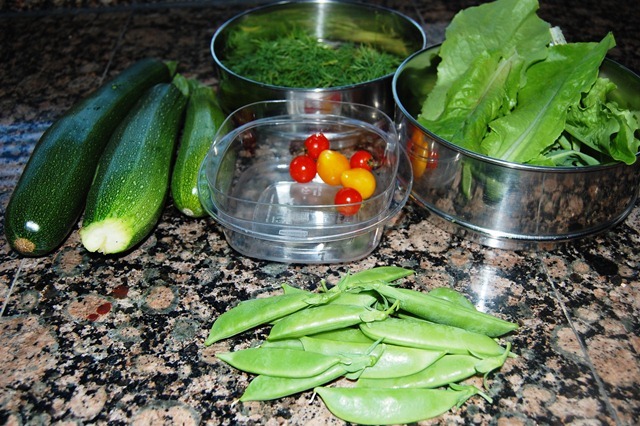 Mix of all – Clockwise from top – Snap Peas (Super Sugar Ann) , Chavali Beans (Asparagus Beans), Cabbage (pinetree early cabbage), Beans (Yellow was). 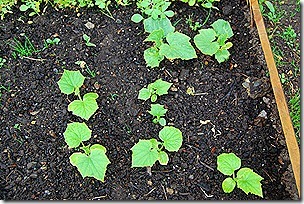 This bed is mix of all – mix in weeds too. 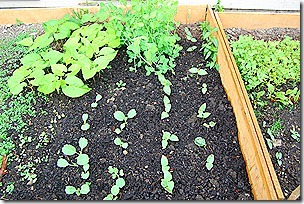 Plan is to harvest peas first, beans will get good space to grow, cabbage will be transplanted to peas space then. 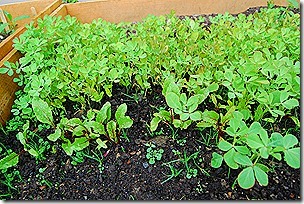 Methi, fenugreek in back and Beets in front. Fenugreek seeds are from local Indian store. 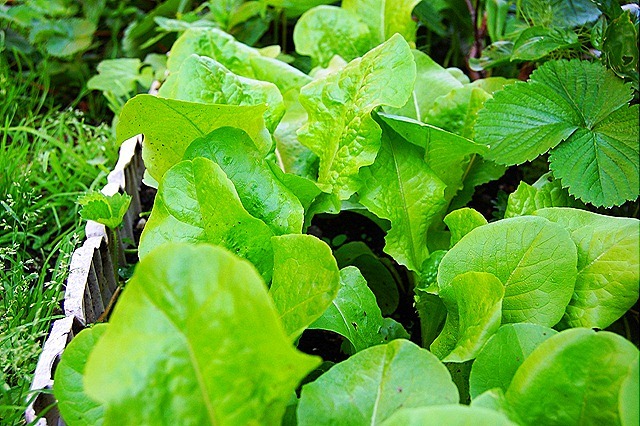 Beets are early wonder. Methi will be ready as early as next week. Cucumber (Mucher): Cucumbers are growing very SLOW. It’s been 2 months and these aren’t even second leaf stage. 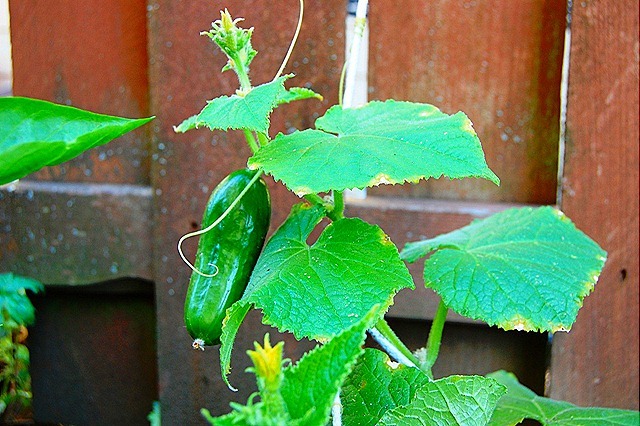 Heat is absent and cukes are not liking it. I won’t even bother putting in trellis for another couple weeks. 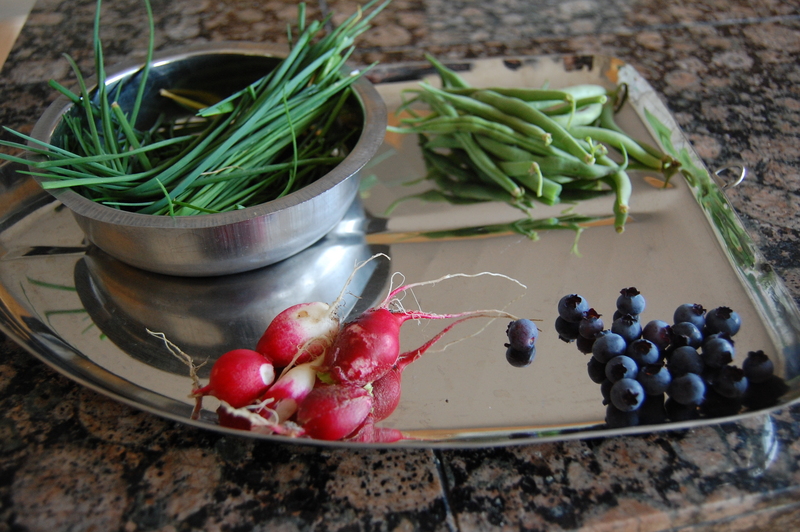 I am back from vacation and garden was filling with goodies, was able to pick up good produce. I really didn’t picture everything that I harvested but here are few shots. Summer is busier with kids staying home, vacations, activities, hikes and much more, I am finding very little time to spend in garden. Really this is the time to relax and enjoy the hard-work we have put in garden over last few months. 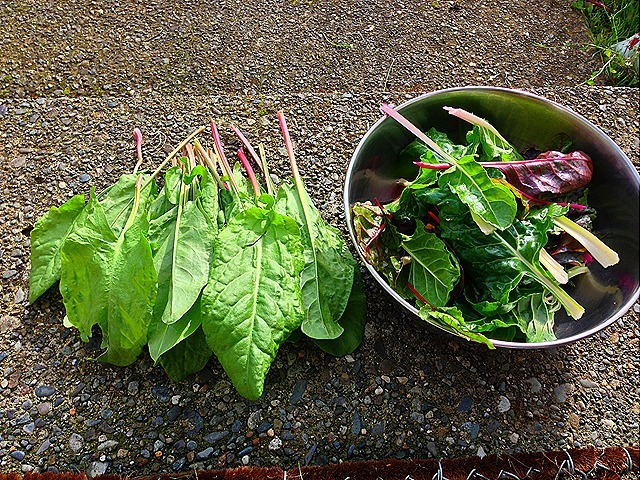 Here are few pictures of harvests over last week. 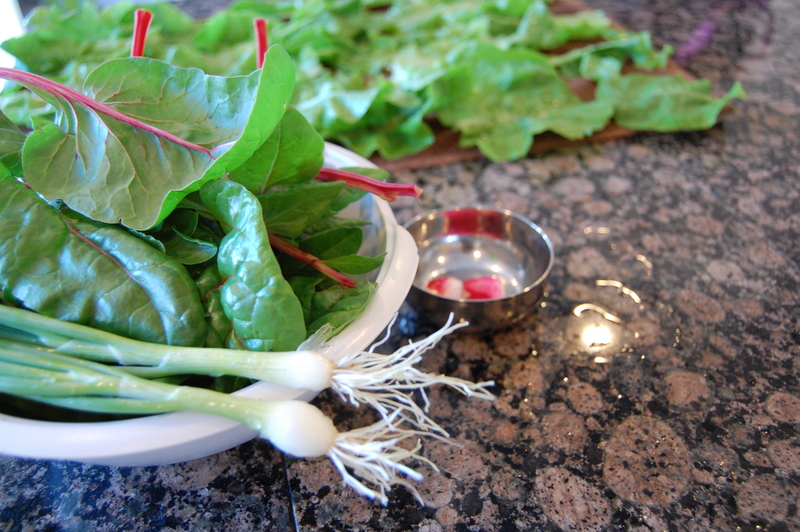 I was able to harvest Green and Wax Beans, 1 big Zuchini, Blueberries (last of the season), Lots of Radish, Chard, lettuce and Chives. Yesterday marked official end of summer. In US, summer ends on September equinox on around Sept 22nd. 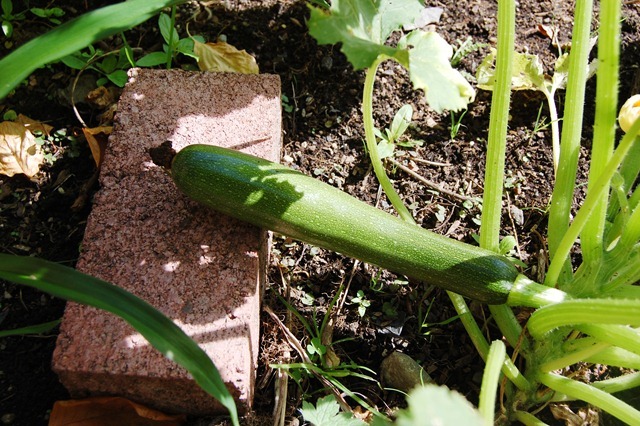 So what summer veggies are growing in my garden on this last day of summer?